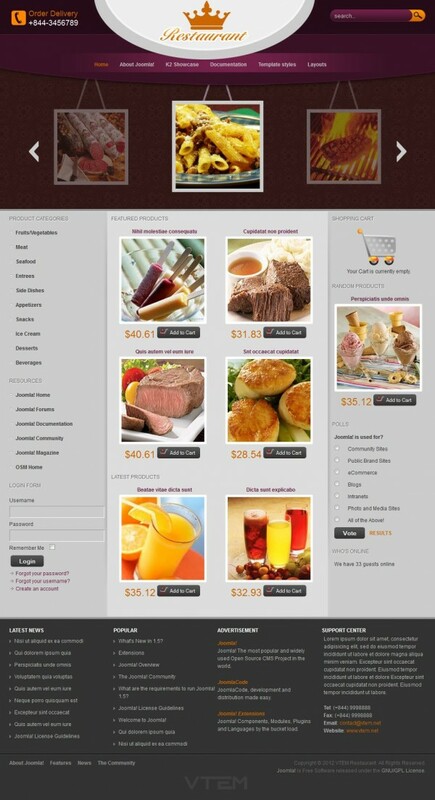 VT Restaurant - nice template for Joomla 1.5 on a culinary theme that supports components K2 and VirtueMart, designed by a professional studio Vtem. This template has 3 built-in visual style and 40 module positions that will ensure optimal placement of all the elements on the site. Among the main dostinstv template is to provide: fast web pages load speed, support for various mobile devices and all versions of browsers. Perfect for creating websites cafes, coffee shops, snack bars and restaurants.